Vegan and Vegetarian options on menus in the past I've noticed some vague nut roast, vegetable medley or vegetable burger. They’ve all offered a very general affair but a few restaurants are now taking on board meat free food needs to be interesting full on taste and texture. Whether it’s ‘Meat-Free Monday’ or wishing to appeal to the vegetarians, pescatarians and vegans among us. 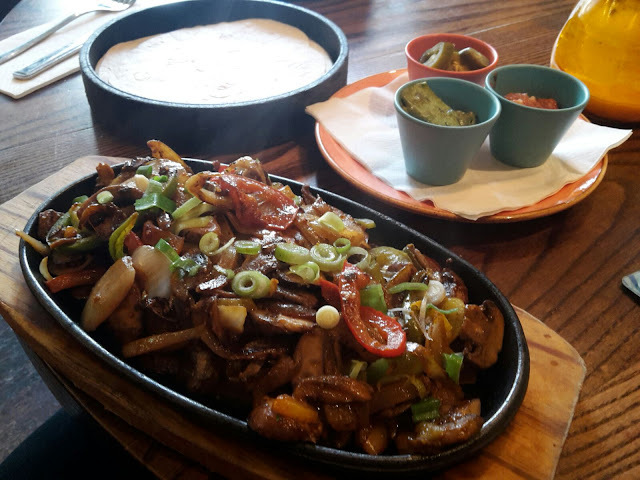 Las Iguanas offers lots of Latin American inspired options which you rarely see on a menu locally to add to the intrigue. With an invite to Las Iguanas to try out their Vegan menu and celebrate World Vegan Day (November 1st) we were excited to see what they could come come up with. I decided to take along the newest member of the Nottingham Food Lovers team, Shareese out to sample something different. Despite being a self confessed hater of mushrooms she was even willing to try some on this occasion. You certainly don’t get a lot of Latin American food from her side of Mansfield. 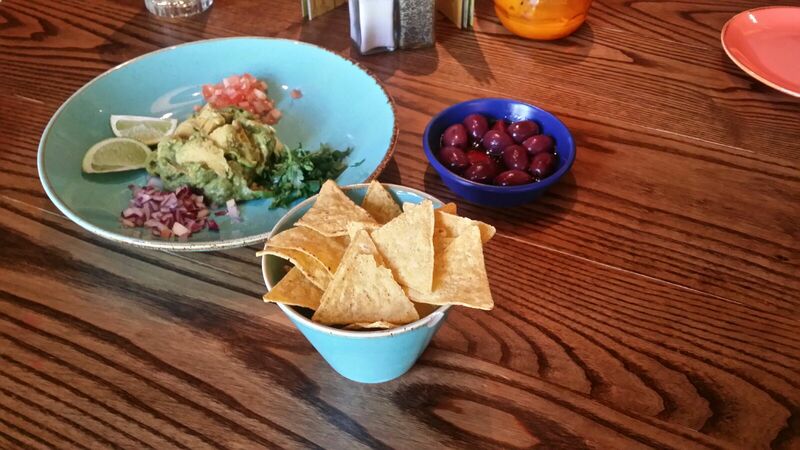 We opted to try tapas starters of Holy Guacamole, Peruvian Botija Olives and Fiesta Ensalada. A great choice was made in the Fiesta Ensalanda. 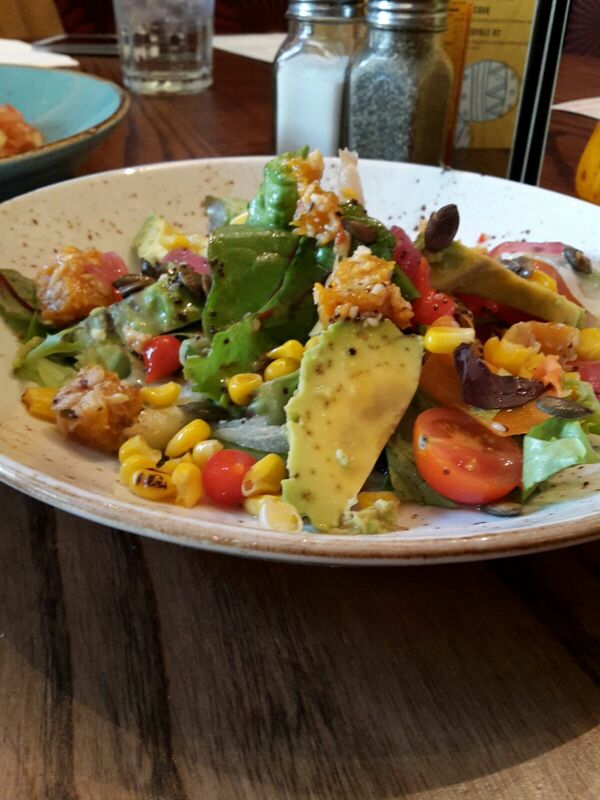 This salad come in a mains course size as well as tapas. This was a fresh citrus dressed crunchy salad with slices of avocado, small pink pickled onions and fantastic cooked butternut squash (A great seasonal vegetable). This was our crowd pleaser starter. The Holy Guacamole had loads of texture and creaminess with the option of lime to squeeze over to give a fresh kick. It was surrounded by red onion, tomatoes and coriander giving every mouthful a different taste. Despite the avocado in the Fiesta Ensalada and the Guacamole it didn’t seem like we were eating the same thing twice and the tortilla chips were soon used up as we feasted away. I personally liked the Botija Olivers, They were a nice, sweet black olive and not bitter like its Greek counterpart. Shareese and I have only recently found we actually like olives so it was good to try another, lesser known variety. Although Shareese was a little disgruntled that the olives hadn’t been de-stoned which put her off the dish. For me however these would be a great snack to have with drinks. Deciding on main course items was hard work I had read in a few blog posts that the Three Mushroom Fajitas were amazing and should be on the must try to list so decided to opt for this option as I love my mushrooms. The sizzling Fajita filling had indeed plenty of mushrooms. Peppers and onions still had a nice slight crunch to them with salsa dip, guacamole and Jalapeños to spice things up a bit. 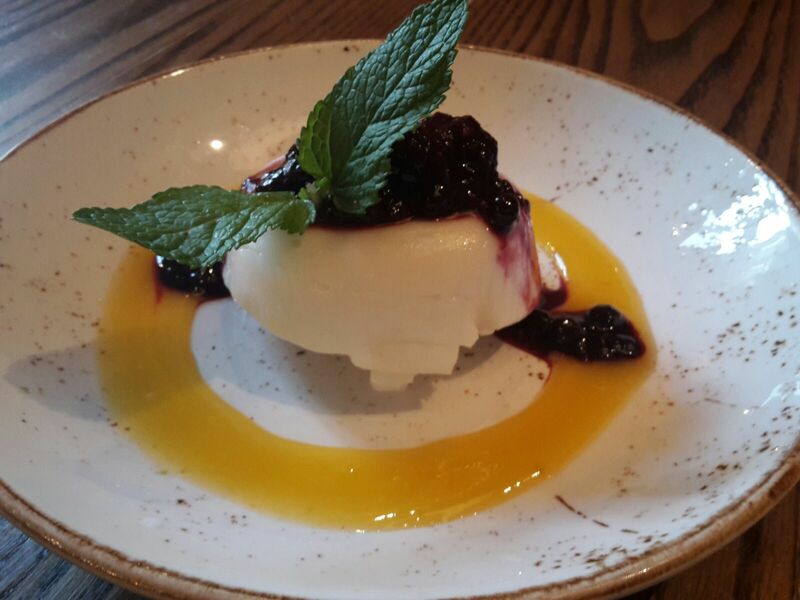 I can really see how a lot of people have raved about this from Las Iguanas previously as it was fantastic and definitely recommended in future. Shareese opted for Moqueca De Palmitos. This was essentially a vegetable curry. Mildly spiced such as a Korma level so no need to worry over it blowing your head off. Featuring sweet potato, palm hearts and spinach. The palm hearts were lovely and sweet. We've never tried them before and had a lovely crunch along with the other vegetables giving the dish a fantastic texture. The rice served alongside was beautifully cooked white rice flavoured with spring onion which complemented the curry well. Definitely worth having again. Only just having a tiny bit of room left we decided on trying the Tembleque which is a creamy set coconut pudding from Puerto Rico which had a great sweetness to it. Though I was glad to have shared a portion as was a large one. Shareese on the other hand would have been more than happy to have one on her own and my leftovers. Adding the fruit compote over the Tembleque it gave a satisfying end to our vegan meal. We had a lovely Vegan meal at Las Iguanas. 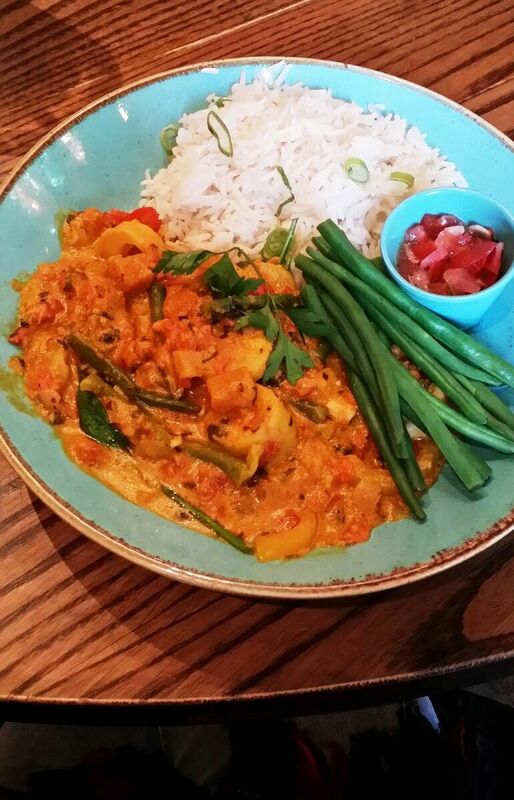 Whilst we certainly do not class ourselves as Vegans we're more than happy to eat vegetarian food on a regular basis and our offerings showed that we actually didn't feel we needed meat with our meals which is a real credit to the food. We're sure Vegans will love the food at Las Iguanas and want to return again and again. They also offer Vegan wines on the menu as well. We never realised such a thing existed until we found out most of the fining agents used in wine production are animal products. Las Iguanas Nottingham, Chapel Quarter, 4 Chapel Bar, Nottingham NG1 6JS. Tel 0115 9596390 for bookings.